Softener Mate is the maintenance companion every water softeners needs. Designed to improve the efficiency and extend the life of your softener, Softener Mate will pay for itself very quickly. If you like the idea of less maintenance and longer life for your expensive softener, you've found the answer. Don't be fooled into thinking salt is the only thing your softener needs! The Pro Products Softener Mate All Purpose Water Softener Cleaner removes organics, silt, dirt, and iron from softener resin. Powder formula for easy storage. Made in the USA. First Application: Dissolve 1 cup of Softener Mate softener cleaner in 2 qts. of warm water. Pour directly into brine well. (Softeners with no brine well, pour directly into salt storage tank when salt level is low.) Manually regenerate softener. Repeat for heavily fouled unit. Preventative Maintenance: Add 1/4 cup (4 oz.) for every 40 lbs. of salt added to the salt storage tank. 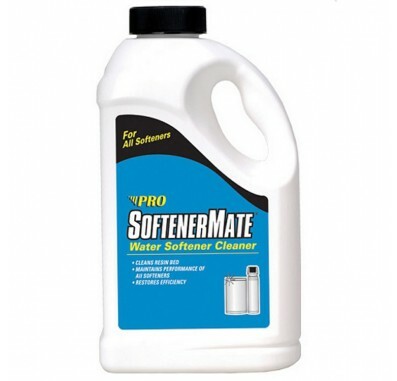 Layer to ensure a continuous dose of Softener Mate softener cleaner with each regeneration.